Coming Soon March 1st - Look Walls Industrial Collection - Look. As I drive to work and around Dallas, I’m inspired by industrial design everywhere I turn. The industrial aesthetic transforms raw materials into sophisticated design elements. Our new collection to be released in March is a mix of dimensional splendor and purposeful grit that will create interest in any space. Comprised of 16 designs, the Look Industrial Collection exposes beauty in what lies beneath. Concrete, metal, and brick all take center stage in this collection. Our concrete-inspired designs vary from raw and natural in ‘Slab’, ‘Etched’ and ‘Cement’ to slick and composed in ‘Galaxy’ and ‘Vague.’ What’s amazing is how these structural elements transform into modern designs. ‘Matrix’ and ‘Squared’ are bold geometric wallcoverings. For a completely different look, the grandeur of the massive stacked bricks in ‘Blocked’ creates an old-world feel, which takes me back to some of our travels. Thanks to our meticulously crafted designs and hi-tech printing capabilities, the designs pop off the wall providing depth. 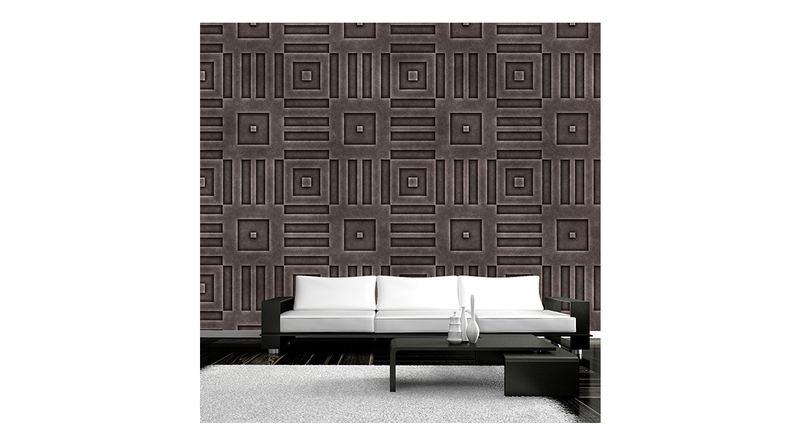 If metal is what your space calls for, the marked metal designs of ‘Grid’ and ‘Urban’ provide sleek drama and interest. Industrial design would not be complete without exposed brick, and ‘Mortar’ creates the most imperfect and realistic wall you can get without laying a single brick. The key to the interest in this collection is two-fold – the design and the substrate. The Industrial Collection is very realistic, but it is not based on photography; they are abstract and unique. Our ‘Steel’ substrate provides the foundation for this collection. There are so many spaces that would make a perfect canvas for Industrial wallcoverings – a hip, modern restaurant or hotel lobby or an office. We hope you’ll check out the entire collection in our online look book that releases March 1st. If you’d like samples to share with a client, we’re glad to help. As always, we’re excited to collaborate with you to continually elevate the art of the wall.